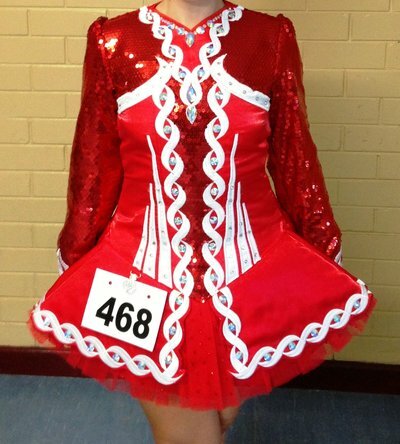 Stunning of-the-moment Gavin Doherty championship costume. Made in June 2013, this dress has only been worn 3 times. The dress is mainly red jockey silk satin, with a red tulle trim underneath the skirt. The sleeves and the middle section of the bodice are made of red glitterball sequin. The cape is the current cut out design and made of red glitterball sequin. The dress has white satin and embroidered celtic knotwork. It is adorned with many large size AB swarovski hand-sewn diamontes as well as hundreds of red and AB swarovski diamontes. Sadly for sale due to dancer retirement. The dancer did exceptionally well at local, state and regional competition with compliments from adjudicators. Dress comes with red bloomers. Price is negotiable, $1200 O.N.O. There is half an inch to let out either side of the back seam. There is one inch inside shoulder seam. There is one inch either side of the side seam under the arm. Asking Price: $US800 ONO. Shipping costs are not included in the asking price. Sale is final.